In every brochure and description of the cruise was written about the possibility that some harbours would only be possible to be reached by tender. Also that we should be prepared that some harbours therefore would not be available for us. My wife goes along on a mobility scooter which is quite handy most of the times, but we could imagine there could arise some problems on a journey like this. So it did not come as a surprise we got an invitation to go to a meeting about that. The harbour of a little village in Norway called Geiranger seemed to be a problem to visit. We did like to go there, saw some amazing pictures on the net and in the brochure. Of course we would attend the meeting, see what was possible for us. We were at sea, did not have a lot to do. Lunch was already devoured and so we decided to go a bit early. We are both former civil servants and like to be in time for meetings. We came in 30 minutes early and took strategic chairs; not too much in front, not too far in the back of the room. Some workmen were placing a screen and a projector. They switched the projector on and checked if the screen was fully used. After that they put more chairs ready for the expected audience. A few minutes after they had left other men popped up. They were dressed differently, it looked to me like they were the technical team. They put the screen a few feet away and pointed the projector again at the screen, attaching a laptop to the thing. A film was started; the sound was almost off, but it was obvious that the film was about tenders. The projector was fine tuned and they left again. In the meantime a new team of workers appeared who started to put chairs away or in a different place. We asked them when the meeting would take place; the half hour was almost gone. They told us the meeting would be in another half hour. We were wrongly informed. There were more guests now waiting for the meeting to be started. A woman in a white uniform (higher in rank, I thought) showed up. She apologised for the wrong info we had been given. A few women in brown uniforms came in and under the leadership of the woman in white they put chairs in the room in a different way. Slowly more people came in and they were told the same story about the wrong timing. The tender film played on, we had seen it more than ten times. Finally some men in white uniforms came in. They fiddled a bit with the projector and the laptop, but soon gave up. It was impossible to improve the sound. Instead they had to reorganise the chairs. Far more people than expected tried to squeeze in the room. A lot were in wheelchairs or mobility scooter. Somehow this was managed and we got a speech from one of the men in white uniform, the safety officer. The tender film layed on. There were strong warning about getting on and off the tender, we were made to pay attention to some of the features of the tender film. The woman in white uniform laid a rubber mat on the floor with two yellow silhouettes of a foot. While the man talked, it was replaced a few times. When the man was done with his speech, he laid the rubber mat a bit different again. The feet on the mat resembled the step people had to take to get on and off the tender. We all had to test to see if we were fit enough to go ashore in Geiranger. People became very nervous. My wife assured me that she was never going to be able to do this. The biggest difficulty was that the step had to be done without using a stick or some other device. The safety officer told us about this a few times. The other staff members looked on in a very serious way; it reminded me of a funeral or such. And then it was time to try. One after another people walked up to the mat and tried. Almost everybody made it after all and there suddenly was a happy and joyful atmosphere. Even my wife could do it. So no worries after all. The fact that we had been in that room for almost two hours was already forgotten. A few days later the cruise ship arrived in the harbour of Geiranger. A ponton bridge was laid out in front of the ship and we could get off the ship in the usual way. No need for the tender after all. But we could see how things could have been. Behind our ship was a ship called "Mein Schiff". 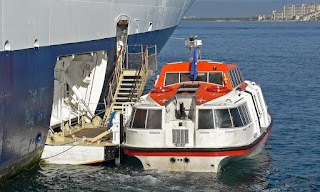 The passengers were going to and from the ship by tender. We probably were very lucky to get to this harbour first.